Make your vocals really cut through! Rated at 500 watts program and 1,000 watts peak power handling capability, the rugged, trapezoidal PV 12M is built to withstand the rigors of the road. The PV 12M can be angled at either 30 or 45 degrees from the floor in addition to being pole mounted. This two-way system features a 12" Sheffield® Pro 1200+TM premium woofer and a 14XTTM 1.4-inch titanium-diaphragm compression driver (no piezos) coupled to a constant-directivity horn with our exclusive Sound GuardTM IV high-frequency driver protection. Two 1/4-inch, full-range parallel inputs allow easy daisy chaining. Top quality performance from a very affordable, low-profile stage monitor! Rockville PBL20 portable Bluetooth speaker with built-in LED touch-lamp! Extremely loud and powerful with industry-leading bass! The PV 12M can be angled at either 30 or 45 degrees from the floor in addition to being pole mounted. This two-way system features a 12" Sheffield® Pro 1200+TM premium woofer and a 14XTTM 1.4-inch titanium-diaphragm compression driver (no piezos) coupled to a constant-directivity horn with our exclusive Sound GuardTM IV high-frequency driver protection. Two 1/4-inch, full-range parallel inputs allow easy daisy chaining. Rockville PBL20 portable Bluetooth speaker with built-in LED touch-lamp! 20 watts peak power. 7 watts continuous RMS. Battery charges with included USB cable. 3.7V / 1800 mAH battery supports 10 hours of playback at 70 % volume. Charge time: 1-2 Hours. Professional voice conformations. Extremely loud and powerful with industry-leading bass!. Bluetooth version. 2.1 with quick connection and long range. A2DP audio streaming with 30 foot max Bluetooth range. Automatically remembers and syncs with previously synced devices. Will control next song, pause, play on popular apps like Pandora, Spotify, Youtube, and others. The built-in mic allows you to speak through the device so you can make and receive phone calls hands-free. Compatible with any Bluetooth devices such as iPad, iPhone, Laptops, Android phone, other cell phones, iPods, other Bluetooth MP3 Players. LED touch lamp with 160 Lumen. 3 level LED light (dim, medium, bright). 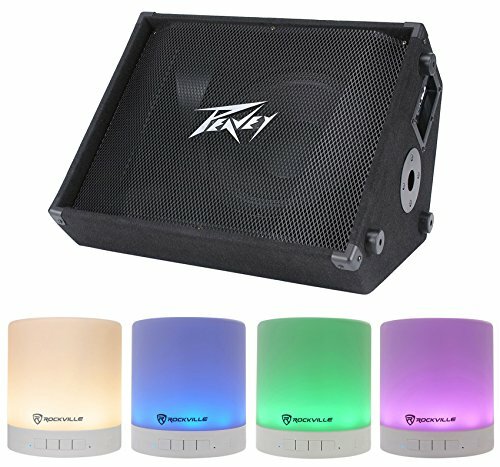 Touch the top of the speaker to change brightness setting and hold fingers on top of speaker for 3 seconds to change lighting mode from standard to color mode. Outdoor hook on bottom of speaker to hang speaker. Plays back SD cards up to 32 GB. 3.5MM aux input. 2" inch driver built in with long excursion for deep hard hitting bass.